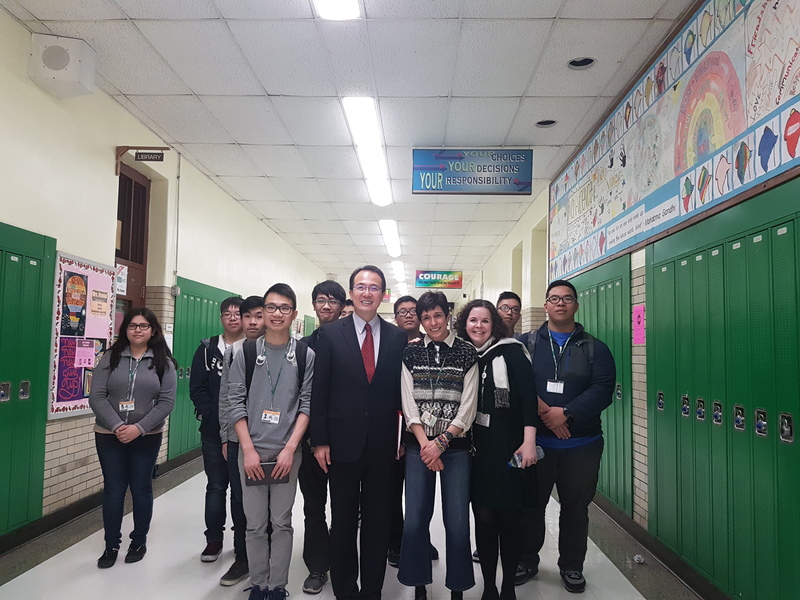 On March 7, at the invitation of the Chicago city government, Consul General Hong Lei went to Thomas Kelly High School in Chicago to give a lecture entitled "China: ancient history, splendid culture and a great contribution". Consul General Hong Lei elaborated on the Chinese history and the major achievements in the fields of economy, science and technology, philosophy and art through slides and videos. He demonstrated the comprehensive development of modern China and expounded China's foreign policy. Consul General Hong Lei said that China is not only a country with an ancient civilization, but also one of the birthplaces of the human race. China went through 24 dynasties, of which the Han Dynasty and Tang Dynasty at their heyday and the prosperous Qing Dynasty under the reign of emperors Kangxi, Yongzheng and Qianlong left an indelible mark in history. The silk road witnessed the economic and trade exchanges between China and other countries, and the seven voyages of Zheng He to the western ocean brought to various countries porcelain, tea and the Chinese people's friendship. Consul General Hong Lei said that China has produced prolific scientists, thinkers, writers and artists throughout history who made a significant contribution to the development of human civilization. The four great inventions, Confucianism and the four classic fictions enjoy world-wide reputation. After the Opium War in 1840, China fell to a semi-colonial and semi-feudal society, and the country’s future was at stake. The founding of the new China in 1949 allowed the Chinese people to once again decide their own destiny, and gain independence and liberation. Since the reform and opening up in 1978, China has made remarkable achievements in economic and social development. Consul General Hong Lei pointed out that today's China has grown into the world's second largest economy, with a leading GDP and over 30% contribution to global economic growth annually. China pursues an independent foreign policy of peace and actively builds a new model of international relations featuring win-win cooperation. China has shared its own development experiences and opportunities with the rest of the world and has contributed Chinese wisdom to deal with multiple international and regional hot spot issues. China actively advances the Belt and Road Initiative, which has been positively accepted by more than 100 countries and delivered a bunch of early harvest results. A growing China will make greater contributions to world peace, prosperity and stability. 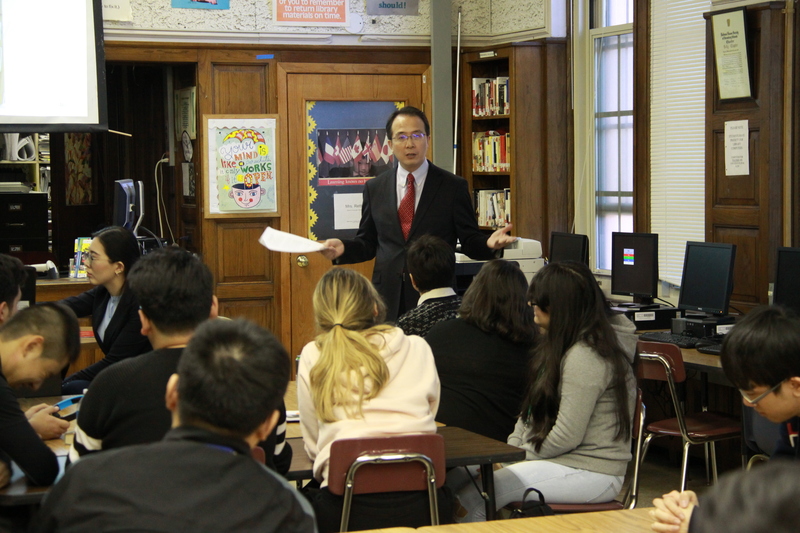 After the lecture, Consul General Hong Lei also answered questions from students and teachers on Sino-US economic and trade cooperation, the new concept of China's economic development, China’s environmental protection measures, wildlife protection and narrowing the gap between urban and rural areas. The principal, teachers and students of Thomas Kelly High School expressed their appreciation to Consul General Hong Lei for paying a special visit to the school to hold a lecture on Chinese history, culture and foreign policy, saying that the lecture was widely covered and thought-provoking, and was very helpful for the students to better understand China.